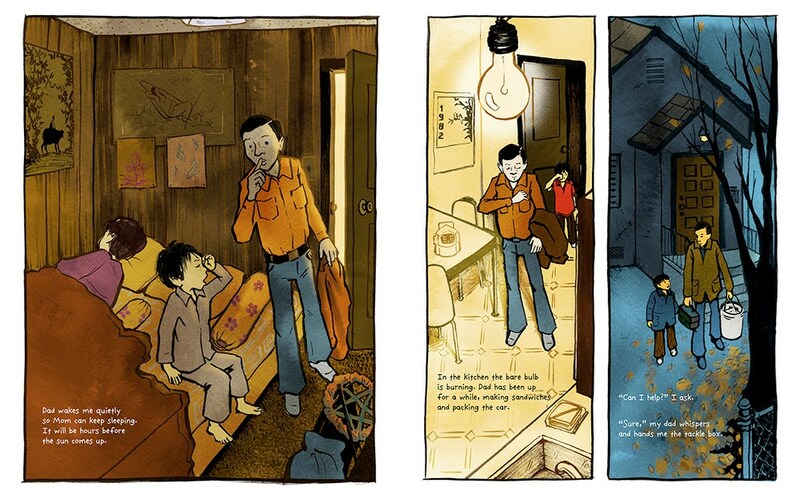 A Different Pond, written by acclaimed poet Bao Phi and illustrated by graphic novelist Thi Bui, is a lyrical, touching story about a father-son fishing trip in the wee hours of the morning. Bao based the story on his own experiences of getting up early to go fishing with his father and the thoughts he had on the future his parents were building for him and his siblings. Thi Bui was truly the perfect illustrator for this picture book. Her illustrations are ethereal, capturing that bleary-eyed feeling of waking up before the sun rises, but also incorporating rich oranges and blues (which are complementary colors) that allow Thi to highlight specific bits of each illustration. The illustrations themselves are inked, with what looks like gouache coloring, so they hearken back to traditional Vietnamese artwork while still maintaining a vibrant, modern look. The technique is a beautiful visual marriage between living in a new world and maintaining tradition, the very two concepts the text explores. What makes this book so unique is the blend between traditional picture book illustration and Thi’s subtle use of graphic novel elements. Readers see various panels on any given spread, so the book becomes a beautifully-designed lesson in visual narrative literacy. How do the panels connect with each other? Which do you “read” first? If we see six images of the same boy in one spread, does that mean there are six different characters? 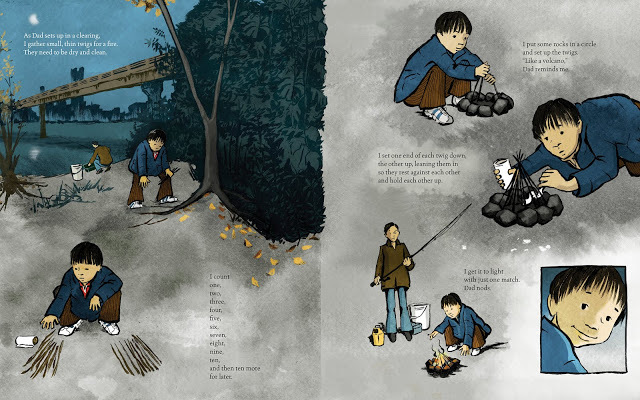 Readers learn that all of these images are connected, and the images of the six boys in different positions across the spread actually indicate the movement of one boy (Bao) across the page: first he collects sticks, then builds his fire, and then he finally starts it. The visual cues — all six boys are wearing the same clothes, for instance — open up tons of room for discussion of what Bao is doing in this scene and allow young readers to practice their visual narrative literacy by picking up on these contextual clues. And, of course, the panels allow for readers to find their own rhythm. Each panel is cordoned off from the others, filled with its own story and emotions. Each panel essentially becomes a smaller story within the larger story, allowing readers to reflect on the actions that occur within each. 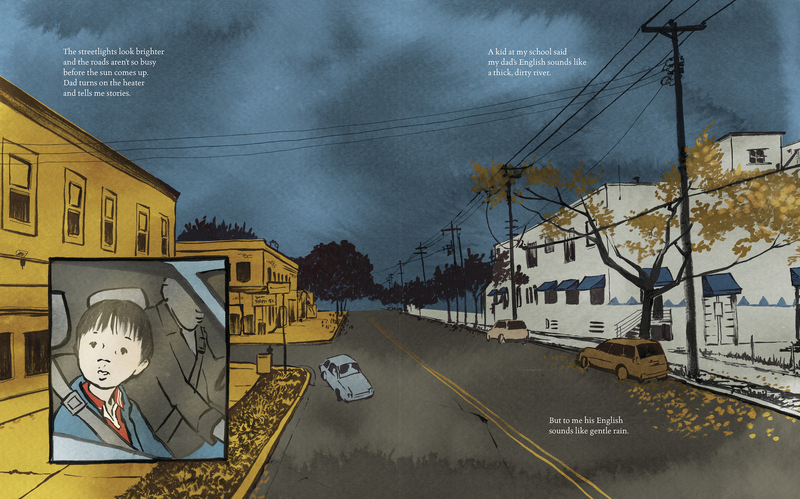 For instance, we see a spread of Bao’s street with a solo panel of him in the bottom left-hand corner. In that moment — the moment of driving to the pond — we get a closer glimpse of Bao’s emotions. So while the text distances itself, remaining mostly factual, we as readers get a brief moment of connection with Bao with this close-up of his face. One of the best books for discussing visual narratives that I’ve experienced in a long time! Join us as we celebrate ALL THE WONDERS of A Different Pond with a podcast interview, a reflection painting craft, a Reader’s Guide, and more. 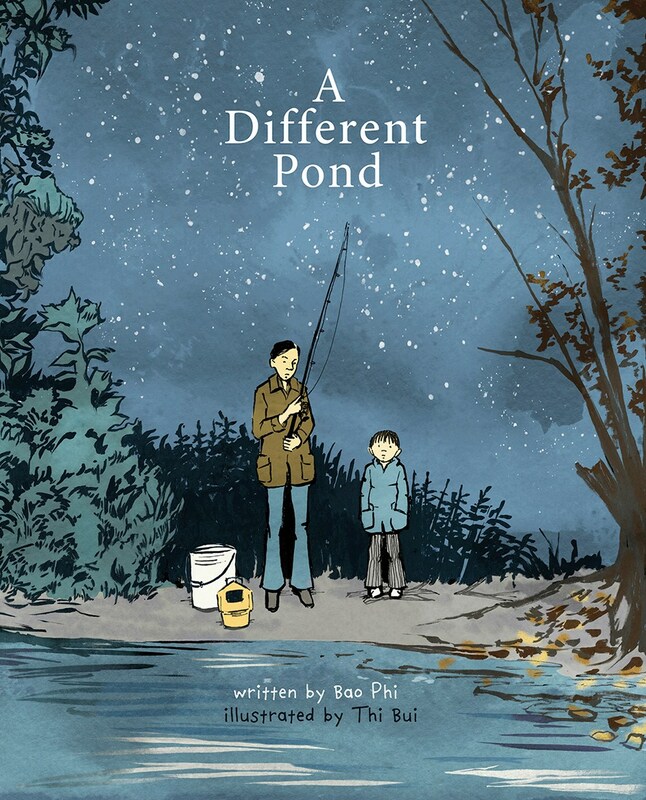 Purchase A Different Pond by Bao Phi and Thi Bui for your reader or readers.